For the first time in its history, the Upper School Legal Wyverns, KO’s competitive mock trial team, advanced to the Final Four in the annual Connecticut High School Mock Trial Competition sponsored by Civics First, Inc. The plaintiff’s side traveled to Middletown Superior Court to compete against a strong team from Stamford’s Westhill High School, arguing Archer v. Detail Security a tort case in which a former college track star is suing a security company after one of its guards shot him with a taser during a Constitution Day commemoration at the State Capitol in Hartford. The next round of the competition will be the first week of March when the Legal Wyverns will take on either Weston or Lyme/Old Lyme High Schools for a spot in the Finals. 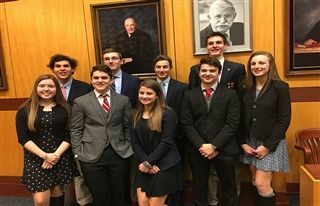 The winning team will represent Connecticut at the National High School Mock Trial Championship, which will be held in Athens, Georgia this May.